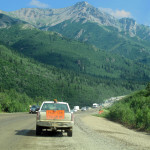 July 10-12, 2015 – George Parks Highway, Alaska – This post is about the highway that connects Fairbanks and Anchorage passing through Denali National Park. 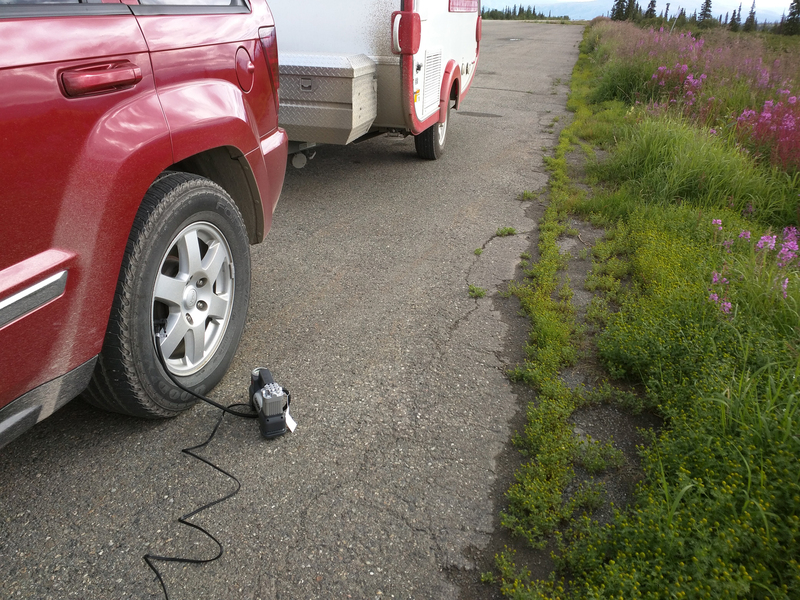 Some construction, a couple of nights in pullouts along the road, views of the Denali range from the south, a quick pass through Talkeetna and a flat tire. Adventures along this route include my visit to Denali by Train, Hiking near the Visitor’s Center, and the Tundra Wilderness tour. Construction projects come in all forms, but this one was the full rework. They had broken up and removed all the road surface and were resetting the roadbed several miles at a time. Most of the work was in the vicinity of the national park entrance. At one of these I arrived just as the last of the previous line rolled away and so I was first in line for the next round. So after a ten minute wait, I got to be the one following the pilot car at the front of the procession. 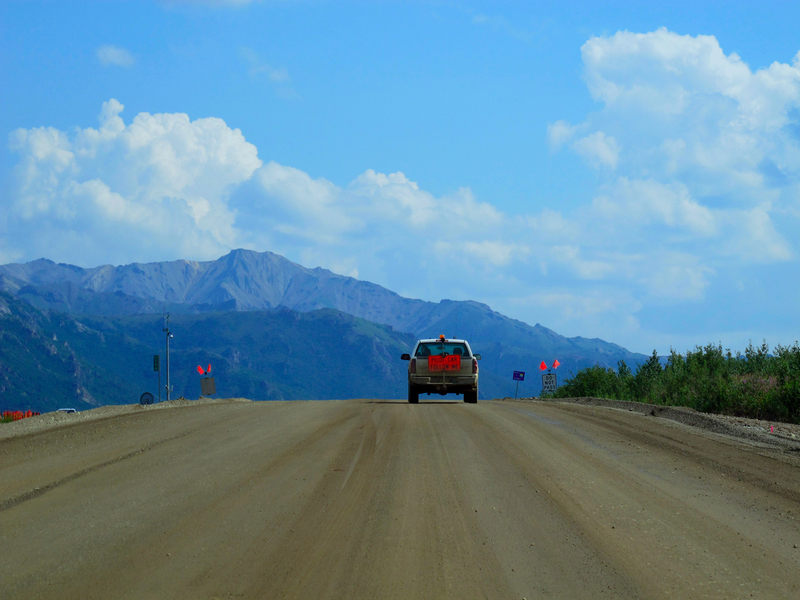 As I noted in another post, the highway heads south along the north flowing Nenana river. 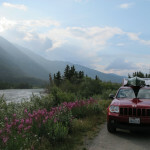 After crossing through the Alaska range along the east edge of the national park the main course of the river and the road part company. The road heads southwest and up a wide valley to Broad Pass. Unless you are paying very close attention you wouldn’t notice the subtle change in flow direction of water in the small streams and shallow lakes. Before the pass it was flowing back the direction you’ve come into the Yukon drainage and a couple thousand miles to the Bering sea, and after it starts flowing in your direction of travel a few hundred miles to Knik arm and the gulf of Alaska. 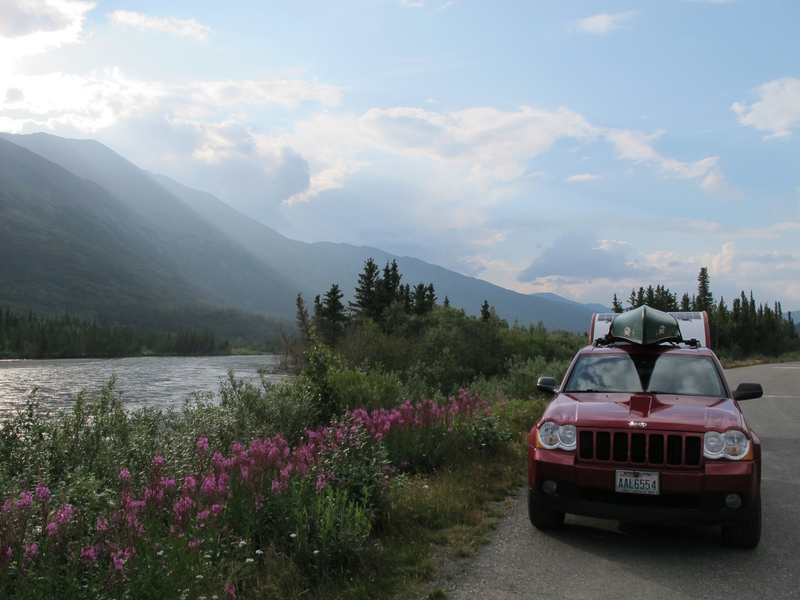 Traveling south from Broad Pass we leave the great Yukon river drainage for the first time in three weeks. Somewhat unbelievably this broad valley is the high point on the Park’s highway at about 2,300 feet. Even though we have traveled through mountains to get here. I took a side trip into the town of Talkeetna about halfway from the National Park to Anchorage. It was a Sunday and the town was awash with tourists and artisans. Parking was looking like quite the challenge with my trailer in tow, so i drove slowly through town. I might mention that driving through town at any other speed would be impossible for all the pedestrians, and I’m sure the trailer got a lot of looks and smiles. But my focus was on people wandering into and along the road. I was lucky to find a place to turn around, and headed back through the fray. The booths and businesses promised lots of handmade crafts and such, but the press of people was more than I was interested in participating in. Especially if that meant hiking ten or twenty blocks back to get there. So I smiled like I was in a parade and headed back out to the main highway. I spent two nights along the highway. One near the park and the other near Broad Pass. Likely designed for commercial trucks, both pullouts were very wide, so that I was forty to fifty feet away from passing traffic. In one case there was also a 20 foot grassy median between the road and the pullout. I was careful not to hog the space, but rather put my little rig in the corner out of the way. At Broad Pass I woke up to find one of my tires was low on air. That slow leak would plague me for a couple of weeks, until I left Alaska in fact. 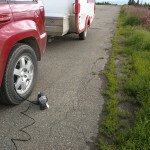 I had a tire shop in Anchorage look it over but at that time the leak was so small the couldn’t find it. It didn’t lose much air when driving, but if parked in some positions the tire would go about half flat overnight. Over time the size of the leak grew until it was pretty obvious. Last to arrive, means a long wait, but then I was first for the next time through. Road machinery scrubbing the pavement. Just a repair, and not a full tear down here. 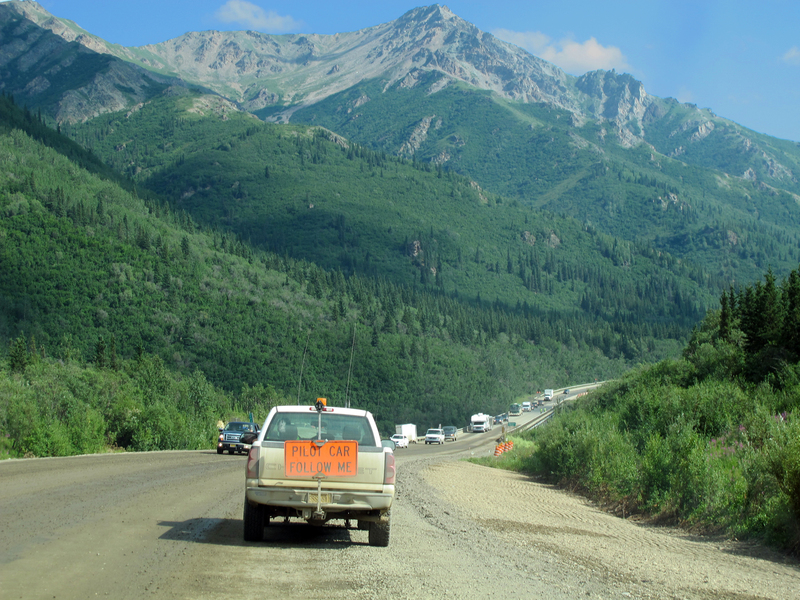 The Parks Highway parallels the Alaska Railroad. I was looking out from the train over here at the road a couple days ago. Sunset late in the evening. Low clouds with morning sunlight. Overnight at a pullout near broad pass. Woke up to a partially flat tire. This slow leak would plague me for a couple of weeks.